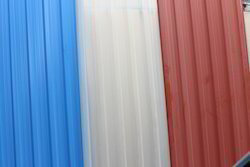 Colour coated roofing sheet for roofing purpose. Supplier of roofing material, color profile sheets, steel deck profile sheets, color coated roofing sheets, color roofing sheets, coated roofing sheets and decking profile sheets. Riding on unfathomable volumes of industrial expertise, we are providing a broad array of Color Coated Roofing Sheet.